Today, recruiting software is being used more and more to help locate just the right employee who will fit the corporate mold. Much of the recruiting industry is using various recruitment software technology as a way of gaining a competitive advantage. Technology can provide an advantage to your organization only if you equipped with the right software that enables you to find the best possible candidate before your competitors. 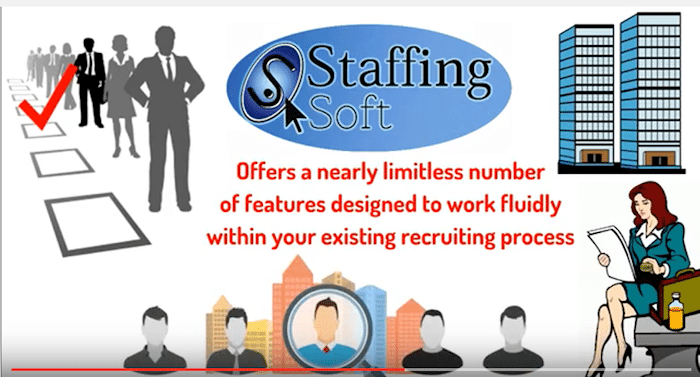 StaffingSoft is an enterprise-wide cloud-based recruiting Software. Our combined expertise has allowed our clients to get customizable solutions since 1989. StaffingSoft offers companies of all sizes a customizable framework that will help them with managing recruiting activities, finding potential candidates, and hiring quality top talents more efficiently and expeditiously. StaffingSoft offers a total online workflow-management system that is easy to use, and yet completed with a powerful suite of tools that provides recruiters with comprehensive end to end recruiting solution. You can now easily manage and meet all of your staffing needs. Shift your team’s focus from wasting the precious time on juggling between data entries and multiple job posting tasks to locate the best possible talents ahead of your competitors. StaffingSoft is designed to help enterprises recruit employees more efficiently. the system can be used to post job openings on the corporate Web site or third party job boards, screen resumes, and generate interview requests to finding potential candidates. The staffing industry can now easily organize their business armed with the tools that StaffingSoft provides, thereby closing more deals. One of the main reason to use recruiting software is that it can save you a lot of time. Instead of relying on old methods of filing paper resumes, you can use recruitment software that is technologically advanced in order to help you to stay more organized. This may not sound like a big deal, but when the resumes start rolling in, being able to stay on top of things is more important than you will ever know. Sure, you are going to have to pay for recruiting software, but in the long run you will make your money back 100 times over. Customer support and satisfaction is our number one priority. After all, satisfied clients are the best source of energy and positive reinforcement for our developers and technical staff to challenge their talent to provide clients with solution to their unique and complex needs. If you would like to see a demonstration of our recruiting software you may request a demo through our website by clicking HERE. Our team will perform a live guided tutorial of our recruiting software at your convenience so you can start realizing the benefits immediately.